The salve for this trauma was to act like an adventurous ruffian of the old American West, and flex his guns. August 1985 offered an opportunity (after the failure of the Thimpu talks), to order (via his RAW serfs) to shoot someone beyond the borders of his country, to arm twist the Tamil militants to dance according to his whims, and place the blame on LTTE. And poor Dharmalingam had to pay with his life. - William Shirer, in The Rise and Fall of the Third Reich. It has been 65 years since Adolf Hitler (1889-1945) breathed last. Though his name is detested everywhere, isn’t it an irony that Hitler’s ideas such as Aryan racial supremacy, ethnic cleansing and genocide, as well as lebensraum (living space) strategy of space encroachment have been borrowed, enameled, polished and practised under various garbs in many countries, including Sri Lanka and India. Call it ‘Gal Oya Colonization Scheme’ of Don Stephen Senanayake or ‘Sinhala Only’ of Solomon Bandaranaike, or ‘Dharmishta Rajya’ of Jayewardene or ‘Mahinda Chintana’ of Mahinda Rajapaksa, their source is Hitler’s Aryan lebensraum strategy of space encroachment. Even during Hitler’s peak years of 1930s, many Sinhalese (though the skin color was brown) prided themselves as belonging to Aryan race that Hitler promoted. In the then Legislative Council, G.G. Ponnambalam Sr. taunted his politician rival Solomon Bandaranaike as ‘pocket Fuehrer’, probably for his tub-thumbing oratorical skills. Not only Hitler’s ideas, but also that of his cronies like Hermann Goering’s Geheime staatspolizei (Gestapo) barbarism and Joseph Goebbels’ propaganda of repetitive lies have become the cornerstone of many repressive regimes, including that of Sri Lanka. Just check the list on “Prominent political leaders assassinated by the LTTE” circulating in the internet, there is this name V. Dharmalingam (MP for Manipay) killed by LTTE on September 2, 1985. This is one of the Goebbelsian lies propagated by the Indian and Sri Lankan websites such as South Asia Terrorism Portal (SATP) (www.satp.org/) and the Sri Lankan army (www.army.lk/ or http://sundaytimes.lk/090524/news/ ). The truth was in the night that spanned between September 2 and 3 of 1985, in Jaffna, much respected V. Dharmalingam with his colleague M. Alalasundaram was assassinated by TELO gun-runners at the instigation of India’s foreign intelligence agency RAW by a mafia-like operation. Twenty-five years had passed since then, and V. Dharmalingam has become a statistic to tar LTTE. The RAW officials of Madras station were the chief conspirators of this twin murder. In this commentary, first, I pay my tribute to Dharmalingam. Secondly, I provide a montage of excerpts culled from the books of authors (Rajan Hoole and Narayan Swamy), who were hostile to LTTE, to provide support for my inference. Dharmalingam belonged to the select few Federal Party MPs who never lost a general election. Others include, V.N. Navaratnam and C. Rajadurai ( 6 wins; Rajadurai did lose in 1989, after he quit the TULF and joined UNP), K.P. Ratnam and C. Vanniasingham (3 wins). Dharmalingam was consecutively elected 5 times. He entered parliament at the age of 42 as an MP for Uduvil in March 1960 and continuously represented Uduvil (later Manipay) for 23 years. He died at the age of 67. “Visvanather Dharmalingam, is the MP for Manipay, the constituency formerly known as Uduvil. Born on February 5, 1918, he had his early education at Skandavarodaya College, Chunnakam, and St. Patrick’s College, Jaffna. After his secondary education he entered the Law College to study for his proctors’ examination, but gave up his law studies to enter politics. Mr. Dharmalingam was elected to a seat in the Uduvil V.C. (i.e., village council) in 1944 and later elected Chairman. He later joined the Federal Party and at the March 1960 elections he was the FP nominee for the Uduvil seat. He won this seat. At the July 1960 elections, he won this seat again defeating the LSSP candidate in a straight fight. At the 1965 elections, Mr. Dharmalingam was elected again. In 1970 he retained the Uduvil seat as the FP candidate. He was returned as the TULF candidate in 1977, for Manipay. Mr. Dharmalingam was placed under detention when he participated in a civil disobedience campaign demanding Tamil language rights in 1961. 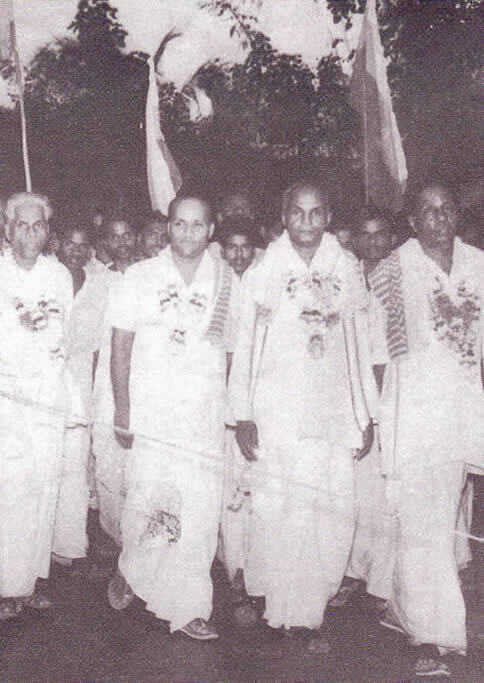 In a photo that I had retrieved from an album book on A. Amirthalingam, we find Dharmalingam walking in a procession in 1974, with his fellow Federal Party colleagues, with garlands. Those featured in this photo, taken at the Federal Party convention held in Mallakam, [from the left] were K.P. Ratnam (MP for Kayts), Amirthalingam (then out of parliament), S.M. Rasamanickam (then out of parliament) and Dharmalingam (MP for Uduvil). It is to the credit of Dharmalingam’s integrity with Tamil voters, that he was consecutively returned in contests with few other Tamil notables of that era who aimed to displace him from Uduvil. These notables included P. Nagalingam (Trotskyist LSSP), V. Ponnambalam (CP), V. Karalasingam (Trotskyist LSSP), and educationist Handy Perinbanayagam. Then in 1977 as a TULF candidate, Dharmalingam received 83 percent of the votes polled, against his next UNP opponent, who could poll only 10 percent. Unfortunately, while living in Sri Lanka, I never had the opportunity to meet Dharmalingam, even once. Registered voters 27,278; Total votes polled 20,710. V. Dharmalingam (FP) 9,033; P. Nagalingam (LSSP) 3,811; V. Ponnambalam (CP) 3,541; J.D. Aseervatham (Independent) 1,552; S. Handy Perinbanayagam (Independent) 1,241; N. Sivanesan (Independent) 1,008; V. Veerasingham (Independent) 312. Majority 5,222 votes. Registered voters 27,278; Total votes polled 18,374. V. Dharmalingam (FP) 11,475; P. Nagalingam (LSSP) 6,704. Registered voters 33,280; Total votes polled 24,228. V. Dharmalingam (FP) 11,638; P. Nagalingam (LSSP) 6,726; N. Sivanesan (TC) 5,577. Registered voters 36,690; Total votes polled 28,775. V. Dharmalingam (FP) 14,120; N. Sivanesan (TC) 11,656; K. Vinothan (Independent) 1,362; V. Karalasingham (LSSP) 1,264; P.V.M.K.M. Sinnathurai (Independent) 254. Registered voters 41,373; Total votes polled 33,001. V. Dharmalingam (TULF) 27,550; R.S. Aloysius (UNP) 3,300; C.P.V.M.K. Muthaliar (Independent) 1,065; K.M. Ratnavel (Independent) 119.
Who was behind the assassination of Dharmalingam in 1985? I provide four descriptions culled from the books of authors (Rajan Hoole and Narayan Swamy), who were hostile to LTTE. These are arranged chronologically. “Although there was formal unity in the ENLF in response to popular demand, they made no attempt to work together. It was well known that Prabhakaran, the LTTE leader, and Sri Sabaratnam, the TELO leader, hated each other. The assassination of TULF MPs Mr. Dharmalingam and Mr. Alalasundaram of 2 Aug, 1985 (sic; the date was 2-3 Sept. 1985) is an example of the methods by which one militant group tried to score over the others. Mr. Dharmalingam and Mr. Alalasundaram were amongst the TULF MPs who continued to reside in Jaffna. On the basis of testimonies given by several persons who had talked to TELO exiles in India, it is believed that this is how it happened. The LTTE leader Prabhakaran reportedly made a strong threatening speech against the TULF. Sri Sabaratnam the TELO leader then gave secret instructions to his men to assassinate the two MPs expecting that Prabhakaran would get the blame and the discredit. My comment: Hoole et al. makes reference to Eelam National Liberation Front (ENLF) that was formed before April 1985, at the instigation of RAW operatives in Madras. Their reference that Prabharan “reportedly made a strong threatening speech against the TULF” is funny and nothing but hearsay. First, Prabhakaran was not an orator at all. Hoole et al. do not mention when and where Prabhakaran made this speech. After the collapse of the 2nd round of Thimpu Talks in August 1985, Prabhakaran went ‘underground’. How could he have made “strong threatening speech” from ‘underground’? Just then, a mysterious twin murder took place in Jaffna. For once, the security forces were not responsible. The victims were former TULF MPs M. Alalasundaram and V. Dharmalingam. Although the murders were eventually linked to TELO, the crime itself has remained one of the unresolved mysteries of the Eelam campaign. On September 2, two young men went to Alalasundaram’s house and requested for character certificates. As Alalasundaram turned to go inside, the visitors pounced on him and dragged him into a waiting car. The kidnappers then went to a marriage which Dharmalingam was attending and told him that Alalasundaram wanted to see him. When he came near the car, he too was pushed in and the young men vanished with the two politicians. Dharmalingam’s body was found the next day near a cemetery with a bullet in the forehead. A handwritten note found nearby said: ‘This is the punishment for those who betray the Tamil race and those who pawn Eelam, especially the TULF.’ It was signed: ‘Tamils with Self Respect’. Alalasundaram’s body had two bullet wounds in the chest and armed and was recovered from Jaffna town. The killings sent shock waves throughout Tamil areas, in particular Jaffna. Dharmalingam was one of the most respected Tamil politicians who had quit the TULF and joined the more radical TELF, but had been expelled. He was a man of simple habits, known for his generous heart, his only luxury being a cycle. He was known to have helped many poor children get admitted into schools by paying for their education. People approached him with all kinds of problems. Alalasundaram, an advocate of the Supreme Court, was also politically active in Jaffna. When he was killed, he hardly had any money worth speaking of. He had to sell his wife’s jewellery when his daughter wanted a bicycle. Read below, for some more details from Narayan Swamy, in the same book. The guy described as ‘Sri’ was the leader of TELO (RAW’s favored pet among the Tamil militant groups in 1985. TELO was also supported by DMK), Sundaram Sabarattinam, alias Sri Sabarattinam. “Sri began feeling a change in Indian attitude towards TELO after the collapse of the Thimpu talks. For the first time since 1983, he complained to colleagues that he was under pressure to strictly toe New Delhi’s line. Newspapers reported after Thimpu’s failure that Sri, along with Prabhakaran, had gone ‘underground’ and was refusing to meet Rajiv Gandhi. The TELO leader was, however, very much in Madras. He also conferred with select TELO leaders on the need to go for independent purchase of arms, saying supplies from India would not continue indefinitely. It was during this period of turmoil that Sri issued an order whose logic and necessity remains one of the greatest mysteries of the Eelam campaign. My Comment: Narayan Swamy has hidden here the fact that Sri was dancing to the tune of RAW directives. Initially, Sri “was refusing to meet Rajiv Gandhi”. After the assassination done, and the blame shifted to LTTE, Sri was retrieved from ‘underground’ and made to meet Rajiv Gandhi, within a fortnight. Could this mean, that Rajiv (as the then boss of RAW’s operations, to take ultimate responsibility) was the hidden conspirator in the plot to assassinate Dharmalingam? And why Narayan Swamy had repeated this canard that the assassination order from Sri “remains one of the great mysteries of the Eelam campaign”? It was not at all a mystery. My Comment: Here, I agree with Rajan Hoole. But, why place a question mark, “prompting by Indian handlers – the RAW?” When one read between the lines of the account provided by Narayan Swamy (1996), it seems clear that RAW operatives themselves were under pressure from the ‘top Congress hierarchy’ to provide some ‘action’. “Prabhakaran was intrigued that journalists were beginning to ask him by 1985 how he would react if India turned against the Eelam cause or asked him to quit the country. After all New Delhi had once packed off Balasingham. Then something happened in Jaffna that made Prabhakaran sit up. In September 1985, for reasons never revealed, TELO leader Sri ordered the murder of two prominent Tamil leaders in Jaffna, M. Alalasundaram and V. Dharmalingam. Both were kidnapped and done to death, to the shock of the Tamils. Dharmalingam was a respected politician known for his austere living. In Madras, a righteous looking Sri condemned the murders. LTTE was blamed for the killings. Many found the linkage plausible as the Tigers had indeed shot and wounded Alalasundaram once. As for Dharmalingam, his son was a member of the PLOT, a group for which Prabhakaran had no love lost. At the time of the twin killings, the Tamil-Colombo dialogue at Bhutan had collapsed. Both Sri and Prabhakaran had made themselves scarce following the deportation of their representatives from India. Amid rising speculation that LTTE was behind the murder of the Tamil leaders, Prabhakaran came out from hiding. When he came to know that TELO had ordered the killings, his suspicion of Sri and New Delhi’s long-term game plan became more rooted. Note that Narayan Swamy more or less had repeated what he had written in 1996. But had tactfully, omitted references to Rajiv Gandhi and his meeting with Sri, after the murder of Dharmalingam and his colleague Alalasundaram. There is no doubt now that Dharmalingam and his colleague Alalasundaram were killed by RAW’s mafia-style operation. Why? Here is the context. Rajiv Gandhi was sworn as India’s 6th Indian prime minister on October 31, 1984, following the assassination of his mother. His strategy of containing the Sikh revolt in the North was failing badly. With the President of Akali Dal, Harchand Singh Longowal, Rajiv reached an accord on July 25, 1985. In a sense, this accord settled nothing. On August 20, 1985, Longowal was shot dead in Punjab. Isn’t the second sentence in the above quote revealing? Rajiv was traumatized by the assassination of his mother a year ago, and this trauma doubled when his Sikh politician counterpart with whom he signed an accord was also murdered in August 1985. The salve for this trauma was to act like an adventurous ruffian of old American West, and flex his guns. August 1985 offered an opportunity (after the failure of Thimpu talks), to order (via his RAW serfs) to shoot someone beyond the borders of his country, to arm twist the Tamil militants to dance according to his whims, and place the blame on LTTE? And poor Dharmalingam had to pay with his life. Dharmalingam’s adopted son Siddharthan belonged to the PLOTE militant group in 1980s, and currently he is the titular leader of the same PLOTE. I have never written about him, other than in one commentary that I wrote four years ago to this website entitled ‘Extras in Film, Politics and Diplomacy’. Siddharthan’s political career has been listless and opportunistic. As he had to dance to the tune of RAW’s music as an extra, it is unfortunate that he had failed to promote RAW’s role as a chief conspirator of his father’s assassination. The conspiratory roles of Rajiv Gandhi and RAW’s direct involvement in the assassination of Dharmalingam and Alalasundaram were too obvious to be hidden. Luckily, for future Tamil chroniclers (like me), in collaboration with his FP colleague V.N. Navaratnam, ‘Dharmar’ had bequeathed a valuable document (via parliament) in 1977, which in current context, is a state secret. What is significant about this document was that it carries the imprimatur of none other than J.R. Jayewardene, the first executive President. I’ll provide details about this document in a forthcoming article that I’m preparing as ‘Sirimavo’s legacy for the Tamils’. H.B.W. Abeynaike: Ceylon Daily News – Parliament of Sri Lanka 1977, Associated Newspapers of Ceylon, Colombo, 1977, pp. 135-136. R. Hoole: Sri Lanka The Arrogance of Power, Myths, Decadence & Murder, University Teachers for Human Rights (Jaffna), Colombo, 2001, p. 338. R. Hoole, D. Somasundaram, K. Sritharan, R. Thiranagama: The Broken Palmyra, Sri Lanka Studies Institute, Claremont, CA, 1990, p. 75. M.R. Narayan Swamy: Tigers of Lanka – From Boys to Guerrillas. Konark Publishers, New Delhi, 1996, 2nd edition, pp. 160-161, 188-189. M.R. Narayan Swamy: Inside an Elusive Mind Prabhakaran. Konark Publishers, New Delhi, 2003, p. 134. W.L. Shirer: The Rise and Fall of the Third Reich. Pan Books, London, 1964, 2nd printing, pp. 304-305.